Almost immediately after Toronto FC won MLS Cup, teams across the nation announced their protected list for the 2017 MLS Expansion Draft. It’s the first real move of the 2018 season, and the first peek at what next season’s rosters might look like. For this edition of the Expansion Draft, teams could select up to eleven players to protect, in addition to homegrown and Generation adidas players who will not be eligible for the draft. So let’s take a look at the Union’s decisions, and consider what those decisions could signal for the offseason moves the Union are planning. These players are automatically protected, without taking up one of the eleven spots. Four of them (including Adam Najem) are shielded because they are homegrown players, and the league’s mandate on youth development demands they let teams hold on to those players. Josh Yaro, after another injury riddled season, is still covered by the Generation adidas exemption. Despite being a player of tremendous versatility and unquestionable ability, it doesn’t seem likely LA would have taken him. But better safe than sorry, if for no reason other than to avoid having to make a ransom trade to get him back. A complete no-brainer. Whether the Union plan on selling him to Europe, or continuing to rely on him to keep the team in games, they can’t afford to let him go for nothing. You don’t let surprise successes like this get away from you. The first curious choice. Epps showed potential, and he’s certainly someone we look forward to seeing more from in 2018. But he also doesn’t seem like the kind of player that would be picked in a draft like this. Not truly surprising, since left backs are so rare a commodity. They could have rolled the dice and looked for an upgrade if he got picked, but they didn’t. And that’s just the reality we’ll have to face should the Union lose someone valuable to the Expansion Draft. Confirming what’s been suspected for some time. Herbers clearly isn’t gone for good, he just isn’t back yet. The Union are likely trying to negotiate a lower salary now that he’s off Generation adidas, and protecting him from the draft ensures they’re the only MLS team at the negotiating table. Similar situation to Herbers. His return wouldn’t be an unwelcome one, but if they haven’t already agreed to a lower salary then do they really want him back at all? Another obvious decision. Medunjanin has brought stability to deep midfield, and it will be interesting to see what he can do with a full season, and eventually pre-season, under his belt. It appears the Union have become fond of the gazelle, and for good reason. His speed is enough to keep any defense on high alert, and that’s something even LAFC money can’t buy. Despite a season that was at best a step backwards, the young right back clearly still features in Jim Curtin’s plans for the future. He’ll probably be the point of the Union attack again this year, but even if he wasn’t, he’s too valuable of a player to just let go for nothing. It’s not impossible that the Guyanese international could be picked, but it’s hard to imagine him being among the five (or even ten) best players available in the draft. There’s been plenty of scuttlebutt about Marquez returning home to southern California, but nothing more than that. However it would make sense for LA to go for a local boy with solid MLS chops. Lots of second string keepers will be available in this draft, but if McCarthy has managed to catch Bob Bradley’s eye it’s not inconceivable that he could go. Realistically this would only a problem if the Union plan on selling Blake this winter, which seems unlikely. Easily the most expensive Union player left vulnerable in the draft. In an ideal world, his signing was a backroom deal with LAFC similar to the arrangement made with Atlanta for Kevin Kratz. Otherwise it seems doubtful the California team would do the Union (and Simpson) a favor to take him out west. A curious decision considering the Union protected three out-of-contract players. But as LAFC has already secured the Egyptian Omar Gaber from Basel to play right back, it seems doubtful they would “waste” a pick on a depth player like Gaddis. Bob Bradley does have experience in Scandinavia, so it could be the Cameroonian-by-way-of-Thailand could be on his radar. But unless Ayuk is leaving Jönköping mid-season it seems doubtful Bradley would pick up a player with time left on a loan. No one, including the third string/Bethlehem Steel FC keeper can be surprised he was left exposed. Already signed up in Bulgaria. But if LAFC wants to secure his rights should he ever try and come back to MLS, they’re welcome to them. As a person, no one deserves another chance more than Charlie Davies. But as a player, there is little reason to expect him to be signed to an MLS team for the 2018 season, let alone drafted. Out of contract and with a heartbreaking history of injuries hanging over his head. Hopefully his story has a happy ending, but it’s hard to imagine that ending being set in Los Angeles. Easily the best running back available in this draft. Hopefully this season wasn’t the final chapter of the Onyewu story, but there’s no reality where a team drafts a 35-year-old (36 by the time season rolls around) center back. Another player with predictions of a return home to Southern California. If he goes, wish him well. If he returns to the Union, hopefully there’s no need to wait for him to play out of a drought again. 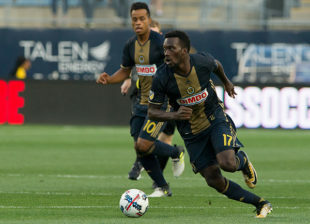 There would be plenty of celebration were Tribbett drafted, but it could come back to haunt Union fans if he manages to deliver on his promise out in California. Some of these decisions are self evident. The Union were only ever going to protect one goalkeeper, and that keeper would be Blake. And since there’s so few forwards on this team of course Sapong was the only protected player. But things get more interesting when you look at the rest of the list. With just three defenders on the list, one of two things is happening. The Union could be considering a migration away from the 4-2-3-1. Even if that were conceivable to the mind of Jim Curtin, it wouldn’t make a lick of sense since two of the protected backs are outside, not center. Which means the other option must be happening: Change is coming. Of course the Union can’t lose all of the defenders they left exposed, Expansion Draft rules state that after a single player is selected from a team, the entire remaining roster becomes protected. But the fact that they’re willing to let any one of those exposed defenders go means they aren’t essential to the team’s plan going forward. Someone is going to fill the other center back spot on the field, and the Union may already be considering someone who wasn’t on the team in 2017. Midfield is a bit more straightforward. By naming six players, two of whom are in active negotiations, they’re showing a commitment to keeping midfield as it is. They’re doubling down on what works, the wing players that contributed most and the deep midfielders that played a major part in what little success the team found in 2017. Short of the absence of a central attacking midfielder (a problem this draft can’t address), this is a lineup fans should be okay with. More is needed, but the Union are holding onto what’s important while letting most other things fall where they may. Epps and the unsigned players over Marquez is the only surprise to me. They must feel pretty good about trusty, or have solid plans to grab an established veteran CB. I would be very, very surprised if LAFC had any interest in any of our players. McCarthy is the one I’m most worried about. Above average backup keeper that could turn into a starter someday. But at the same time I don’t expect them to draft a backup goalkeeper. I was thinking the same thing. While most teams don’t need to protect their backups, Blake is likely to miss some time during the season with international duty. OK, we can fill that hole. Seriously, the talent on this team doesn’t call for that much concern. Everyone we made available is replacement level. With LAFC only having five picks, the Union will lose no one in the draft. If it’s anyone, Marquez might get picked because he’s relatively inexpensive for a back-up centerback, but I honestly think that he (like most Union players) is not that highly rated by other MLS clubs and LA can find that type of player through other avenues. I think that the Union were smart and protected the players that were most at risk for being picked. LAFC can walk into East LA or Maywood, CA and find a better back up than Richie Marquez in a Sunday League. Don’t the Union have 5 protected backs rather than 3? Rosenberry, Elliott, Fabhino, Yaro, and Trusty? Yeah I guess the wording is less than perfect. I should have said they CHOSE to protect only three. I hate the feeling, but everything the Union has done just smells of status quo. Picault, Herbers and Epps are all young and backups/spot starters. Please take Simpson! Please, please, please!! That would free us up to go out and get a back-up forward that actually fits our formation. Surprised Marquez was left unprotected while we protect three ‘maybe’ players? Now that we don’t have Gooch (why did we get rid of him? even with a raise I have to believe he’s worth it) or Tribbett, we need a big man back there. Sidenote – with Epps, Ilsihno & Herbers we’re 3 deep at RH. And the Union lose….No one. Considering that they went with a lot of speed, it’s probably a good thing we protected Fafa. He would have been very intriguing to them. Not that he was in danger of the Union leaving him unprotected, but he may be the only one who would have turned their heads, based on their selections. It will be interesting to see whether LAFC keeps the three youngsters. All are experienced MLS backups. If all three were sold back to their previous clubs, the black and gold would recoup a good chunk of the allocation moneys they lost getting Walker Zimmerman from Dallas. The other point is that the known LAFC roster moves so far are either attackers or defenders. No midfielders. Did LAFC select people with a primary objective of creating holes on conference rivals? Just asking for a friend. Well, they just took two of the players that they picked and traded them for Laurent Ciman. So their starting CB’s are Zimmerman and Ciman…WOW. And Ciman moving to LA upgrades the very good medical care for members of his family to the world class services of Los Angeles. I have a vague, vague memory that coming to North America may have had an added dimension of addressing the special needs of a family member more effectively. All the best, except against the Union. I’m all for having a long term plan, but long term plans are eventually rendered obsolete unless iterated in light of what is happening in the present. Back to hibernation… be well. Hopefully, we see EVIDENCE of iteration. If not, due to financial or other constraints, the call for selling the team will continue to grow. I hope for the former outcome, but until a pattern of evidence is observed, my investment of time and energy has redirected. Just being honest. Life is too short.